I personally am convinced that I am not reincarnated - that this is my first and only mortal life. At the same time, people whom I trust are convinced that they are reincarnated. I think that some people are reincarnates, others (like me) are not - in fact I think reincarnation is very probably unusual, but I'm not sure. How about you? Do you know whether or not you personally are reincarnated? If you haven't ever thought-about and reflected on the subject - why not do so now, and let me know your conclusion, please. I seem to spend much of my life thinking about matters that most other people never think about even once; and for more than a couple of decades I have intermittently mulled-over a concern that Christianity - as it has been thus far - is a typical product of a middle society. Religions that are associated with agricultural societies (and some more complex hunter gatherers - like North West Pacific Amerindians, and Australian Aborigines) are 'totemic - with fixed beliefs and rituals, priests in a hierarchy - and, when there is literacy; scriptures, laws, legals procedures... all actually-existing and viable (not collapsing) religions for millenia are of this form. Since modernity, we have had the variable survival of middle society type religion in a context of general collapse of religious viability, and weakening of religion as a factor in life. The implication therefore seems to be that middle society religion is the only kind of religion; and therefore for a Christian the implication seems to be that modernity must be abandoned, and society should recur to an agrarian level - we should go back to the kind of life of the dark ages, the middle ages, or the Christian Roman Empires (Byzantium, Holy Russia etc). That was pretty much how I was thinking when I wrote Thought Prison (published in 2011) - but I was not able to convince myself of the validity of this perspective. Mostly, this was because I could not regard the middle society Christianity as being good enough. There seem to have been many aspects of those Christian societies that were wrong, un-Christian - in particular the way in which the religion was centred in the institutional priesthood, with the individual's primary role being obedience. This fault was addressed by the Reformation - but not effectively. This was also associated with an idea of God that retained many aspects of the un-loving pagan deities - the Christian God was (not always, but far too often) being treated implicitly as if he were a tyrant rather than a loving Father. This fault was not addressed by the Reformation - indeed the Calvinists were more extreme in this fault than the Roman Catholics. My conclusion is that we Christians have no alternative but to move forwards into the unknown and a new form of Christianity that is neither the evil present, nor yet the suboptimal past of the middle societies. This almost certainly sounds vague, wishy washy, wishful thinking, pie-in-the-sky - and there isn't much that can be done to dispel that criticism since there are no examples to point-to (just individuals who seem to embody it - those Romantic Christians like Blake, Coleridge, Wordsworth, Steiner, Barfield and Arkle who I so often mention on this blog) - yet it seems a solid and sustaining conviction to me - able to support a life of faith and courage. Either way, this is the position I have been forced-into by self-critique and the attempt to be honest and to avoid self-deception. In sum: Christianity is true, so we must be Christian - but no previous or actually-existing institutional form of Christianity is a suitable model for the future (although one or more may be a suitable basis). There will be (and needs to be, and should be) a process of evolutionary change in the direction of greater individuality of spiritual life - greater contact with the divine, greater awareness of the divine within - and a pervasive awareness of God as our wholly loving Father. An evolution (or unfolding) that is an enhancement of the strength of faith, not a dilution. This little-noticed but wonderful quartet opens the title sequence of Migh Leigh's Topsy Turvy movie about Gilbert and Sullivan's writing of The Mikado - one of my absolute favourite movies of all time. When I sang in the Mikado the second time, playing the minor role of Pish Tush (the character who speaks at the beginning of the above clip); my brother, who was directing, was kind enough to write me into this song, sharing the lines with Pooh Bah. Evil is more prevalent now in The West than at any time or place, for the simple reason that it has become invisible - and this invisibility is due to the lack of any perceived alternatives. Since the mass decline in religion - there is nothing to provide a contrast with what is: almost nobody with power now believes in life beyond mortality, hence this is excluded from public discourse even as a possibility. Few even believe in the possibility of 'utopia' - except perhaps the Transhumanists who see life only in terms of here-and-now feelings, and who yearn for technological 'solutions' from breakthroughs in medicine, drugs, genetic engineering - and perhaps the provision of wholly-satisfying (but fake) alternative virtual realities. For such people, The Matrix movie scenario of human consciousness living in pleasurable dreams while their bodies are exploited depicts a paradise not a hell; because as long as people think they are happy, it does not matter what is really happening. Fortunately, it looks as if science, technology (and economic efficiency) has plateaued and begun to decline, and this will probably trigger collapse of the global bureaucracy before we have the ability to impose on ourselves what we seem unable to recognise as universal enslavement. There are, of course, real alternatives that we could imagine, if we allowed ourselves - including better futures; better futures than any past... from a spiritual and Christian perspective; and in a timeframe which extends beyond death. It seems clear that human life is not meant to be mere pleasure; but must and does entail some kind of struggle with experience; and from that perspective the experience of life here and now is extraordinary in its capacity to educate us, to make us more insightful and wiser... but only if we take a perspective that includes the spiritual as well as the material, and which does not equate Man's freedom and agency with isolation and relativistic nihilism. As I have often said: we can aspire to be both spiritual and Christian - a Christianity rooted-in and guided-by the freedom and truth of our partly-divine self in direct communication with full-divinity. In the late 1960s, US scientist John B Calhoun created a ‘Mouse Utopia’ – an artificial environment which provided what he regarded as the perfect breeding conditions. To everyone’s amazement, and without any signs of disease or hardship; after a few months of rapid population growth, the mouse colony ceased to reproduce at all; and soon became extinct – every single mouse dying within three years. Could Mouse Utopia have lessons for humans? Well, that depends on the explanation for extinction – but if Michael A Woodley’s hypothesis that the mice died of ‘mutational meltdown’ is correct, then humanity’s days could be numbered. Woodley’s hypothesis, which seems to be the only one to fit the facts (unlike Calhoun’s own explanation of ‘overcrowding’), is that it was exactly the utopian perfection of conditions which killed all the mice. The idea is that mice depend upon a very high death rate (mostly from predation) to filter-out new and harmful genetic mutations which spontaneously arise each generation. When nearly all of each mouse generation survives and breeds, then the harmful mutations rapidly build-up to produce genetically unfit mice who lack desire to breed, and who neglect their young. Exactly the same explanation could apply to Western humans since the industrial revolution; because the average premature death rate, both pre-natally and in childhood, has declined from about two-thirds to only one percent. If we assume that most of the uterine and childhood deaths occurred among those least-fit children with the most mutational damage – this must mean that Western Man has accumulated something like eight generations worth of damaged genes. But how bad are human mutations? Geneticist Michael Lynch estimates that there may be dozens of slightly-harmful mutations per human generation, among which approximately one to three mutations will be significantly harmful. So, lacking the harsh and cruel filter of high child mortality rates, each modern human generation would be expected to accumulate a couple of extra harmful genes. What effect might these accumulating mutations have? Well, in a word they will reduce ‘fitness’ – Lynch suggests each harmful mutation might reduce reproduction by one percent - which means they will in multiple ways reduce reproductive potential for a given environment (multiple ways according to the chance of which gene is mutated). So, it seems that the average modern human surely must be less genetically fit than his ancestor of two hundred years ago. Then, why isn’t this more obvious? One reason may be that the most sensitive measure of reduced fitness is psychological, rather than physical. We are therefore first likely to see biologically-damaging changes in social, sexual and offspring-rearing behaviours; before we see any clear increased rate of diseases (although an increased rate in genetic disease would eventually be observable). However, on the other side of the coin; reduced fitness would only be directly measurable if the environment had stayed exactly the same as in 1800; whereas we know that the modern environment is much less harsh. There is less starvation and less infectious disease; there have been breakthroughs in medicine and surgery, the expansion of the welfare state – and so on. It seems likely that a softer and more comfortable modern environment is mostly concealing a decline in modern fitness – and life expectancy has been rising for many decades. But declining fitness is evident in the most fundamental biological measure – which is reproduction. It was declining reproduction that caused the extinction of Mouse Utopia; and the same pattern can be seen in the prosperous developed nations today. For example, the age-adjusted native population size has been declining in Britain for several decades, since deaths exceeded births in the 1980s. The average number of children per women is now much less than two, especially among the wealthiest and most highly educated (ie. those best able to care for children). Median average age (excluding recent migrants) is probably into the late forties, which means that a large majority of native Brits are beyond reproductive age. In brief, the British population is headed for extinction – and for psychological rather than physical reasons; and the same applies across all developed nations. Woodley’s ‘mutational meltdown’ scenario would be expected to kick-in as population decline combines with mutation-cased fitness decline to make a down-spiral of ever fewer, ever more damaged people. What are the prospects? In a way the human situation may be worse-off than Calhoun’s mice; because we are in the position of having to maintain our own ‘utopia’. But mutation accumulation will progressively erode our ability to sustain a modern civilisation – as average health, adaptiveness and abilities decline with each generation. Sooner or later, the older mutated population will become unsupportable by the even-more-mutated younger generation. On the positive side, it seems likely that something important is missing from the simplified biological model underlying the above calculations; and there are positive, cohesive forces at work which may tend to compensate for mutation accumulation. I personally believe that there are as-yet undiscovered factors which tend to work in opposition to the degenerating effects of natural selection. The question is whether any such positive factors will be strong enough and rapid enough to let us escape from the collapse of ‘Mouse Utopia’ which otherwise seems inevitable. ...The past nine months have been valuable in revealing the main reason why the rest of the EU wanted Britain to remain. It is what the Eurocrats call 'the free movement of people' but which in practice means that the UK is valued primarily as the major dumping-group for people that the rest of the EU does not want... That the EU does not want these people is clear from their behaviour towards them. 1. We live in a creation - that this world is created. 2. The creator is loving. 3. We are the creator's children. Unless you are prepared to entertain these as genuine possibilities; then you have not even begun to evaluate Christianity. The picture is The Seeker - by William Arkle. The artist provides the following explanation: "The person who takes the trouble to know and understand the more ethereal and subtle realities of his nature is rewarded with an inner vision which transforms the significance of the world about him. This picture does not suggest that the vision is seen in this way with our physical sight, it can only try to communicate an intuitive apprehension for which there is no language. 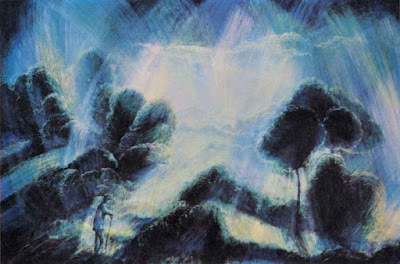 In this, as in many of the other pictures, the demand on the viewer is great since he must enter into the spirit of the attempted interpretation of dimensions of light, space and spiritual atmosphere." The Gospels describe that Jesus refuses to say anything at various points in his 'trial' with Pilate, Herod and the Jewish elders; and this puzzles and annoys the authorities. The silence of Jesus when confronted with his accusers is also something that many later people have found confusing - perhaps especially given that in other parts of the Gospels Jesus is shown to be a brilliant rhetorician and arguer. Did Jesus, perhaps, 'refuse to defend himself' - was he 'courting martyrdom', or was it something else? My feeling is that the silence of Jesus was necessary because of the falsehood of the bureaucratic and legal process to which he was subjected. The 'trial' made so many false assumptions - was indeed structured on the basis of selective and biased assumptions that were nonetheless being regarded as the only things that matter. Merely to participate in the, by saying anything at all, was therefore implicitly to endorse a lie. Since Jesus was without sin, he could not lie; therefore he could not answer. We have likely experienced for ourselves an exactly analogous phenomenon in modern societies; because false assumptions are deeply-woven into mainstream public discourse - woven into bureaucratic processes, legalism or media discourse. The procedure is evil: the procedure is a lie - to participate in the procedure is to endorse the lie. Modern public life is therefore a set of trick questions and traps; and all possible answers lead straight back into the trap. In such situations, the aim is to force us (each, individually, without exceptions) to become complicit in the process - to force us to participate in The Lie. No honest answer is possible, because all honest answers must challenge the assumptions behind the question - honest answers are not accepted as data. In such situations the only honest answer may be silence. 3. In this world and during mortal life. The implicit assumption of utilitarianism is therefore always and necessarily atheist, materialist, positivist, modern and Leftist - no matter what individuals may say about their personal religious or spiritual beliefs; or whether they may imagine themselves to be reactionaries or Right Wingers. Many things - but a hedonic pleasure-pain quantitative calculus was never the bottom-line until modernity. In modernity, utilitarianism is both the public ideology (what people ought to believe, according to mainstream propaganda) and the actuality (in the sense that other motivations are enfeebled and ineffectual). Yet utilitarianism is demonstrably incapable of motivating a coherent society or human life - and instead there is a pervasive despair, self-hatred, and desire of self-annihilation. Utilitarianism is, indeed, merely one-step away from nihilism - that is from the denial of reality; from the conviction that reality is-not-real. By trying to base life on feelings, and by pretending that feelings can be meaningfully predicted, manipulated, measured and summated - utilitarianism has built modernity upon sheer incoherent nonsense: that is the foundation of everything. In sum; utilitarianism is a false and deadly metaphysics - a set of nonsensical and wicked assumptions. Unless or until we recognise this as a fact, and change it; we shall remain locked-onto the cultural destination of willed damnation. The consciousness of our real self is largely beyond the understanding of our more familiar 'personality self'. At its most fundamental level, the real will is divine; and at this level the purpose of the real will mixes perfectly with the purposes of other divine beings. The real will is the manifesting of this already-harmonised divine purpose throughout the lower levels of creation, and eventually right down to the physical level. Thus our real self witnesses itself as it becomes more fully mature and at the same time helps to perfect the purposes of others. The real self has this power in it as a part of our divine heritage. All nature responds to the proper command of the real will of the real self. But the will does not command 'willfully' - it achieves command by being more fully what it is. Thus the 'sound' of the quality of its individual being mingles more loudly with the creative sound of God. What we usually call 'will' is actually more like 'desire power' and 'idea power', through which our lower self focuses on things it feels it wants or needs. But what we feel as a need in the deepest sense is not something we can 'make a decision about', we just pretend that it is a decision. Our real will has already-decided, and is something we can only be either true-to, or untrue-to: the real will is not something we are in a position to use. Edited - for clarity, punctuation, emphasis and language - from the Summary of chapter sixteen - The Will; from A Geography of Consciousness, by William Arkle, 1974. 1. The true individual nature of each person is divine - that is, it belongs to the nature and function of the absolute - as a consequence of all men and women being God's children. 2. Therefore, we are, each of us, directly in touch with the power and purpose of the absolute, with the divine nature - at least potentially; simply because some of the divine nature is within us. 3. However, although the divine is active within us; we are initially (personally and culturally - in childhood and in early tribal societies) unconscious of the divine within ourselves. It affects us - but we are not aware of the fact. 4. As human consciousness evolves towards higher (ie. including more self-aware) levels - we get to a 'dead centre' of total self-consciousness cut off fro awareness of the divine. This state has been called the 'dead centre' of consciousness, or the consciousness soul - it is the adolescence of human personal and cultural evolution - a necessary transition phase. This position must be moved-through before we can become actively aware of the divine within us; that is the actual experience of the divine within us (not merely the abstract fact of their being a divine element in us). 5. But, even before we are actively aware of the divine within-us; it may be at work in an unconscious way - expressing itself (or at least trying to express itself) as may be evident implicitly. For example, our behaviours may be shaped against our conscious will - our superficial and intellectually- or socially-moulded plans and schemes may be self-sabotaged; or synchronicities may channel us in certain directions. 6. The real self - that is, the divine self, is attuned-with the divine level of action. Each person is, in this way, an essential part of the divine plan of creation. However, to participate; he or she must freely opt-in to this plan, on the basis of love and awareness of the divine plan (made possible by the incarnation, death and resurrection of Jesus Christ). 7. At the highest and deepest level our Life is a destiny - and indeed an unique destiny - yet that destiny is a gift, and as-such it may be declined. 8. At the deepest and highest level the true 'will' of our true self is not chosen by us - because only at this divine level - in which the wills of many beings are harmonised. 9. Thus, because of this high-level harmonisation; the will of any one individual cannot 'sabotage' the divine plan of creation by any act or will at a lower level of consciousness. Each individual can either join in the work of creation, bringing his or her unique nature to the open-ended task; or he or she may decline to participate - leaving a gap in the original divine plan, and causing a change in the unfolding of creation. 10. The divine plan cannot be sabotaged in its character and aim (the specific plan is optional, non-mandatory, freely chosen); but it can be changed in its specifics (the plan is not a blueprint but evolutionary, pluralist, endlessly creative). It is important to realize that much of what may appear unnecessary in a human being for outer life, nevertheless, plays an important part — similar to the way we see outer nature. Just compare the infinite number of herring eggs, distributed all over the seas, with the number of herrings actually born , and you could easily reproach nature for being tremendously wasteful. However, this could only be the opinion of those who do not know of the powerful spiritual effects the dead herring eggs have on the growing herrings. A certain number of eggs have to die so that a certain number of eggs may thrive. These things are all interconnected. GOD: You simply cannot do everything all of the time. Experiment and waste go together and lead to discovery, so don't become anxious about results. Try to enjoy the process itself which allows for lateral thinking and lateral diversions. The new things are not found where you expect them to be. We can't live "new beginnings" without letting go of the "old beginnings" and allowing them to slip away. All that is really valuable will come back to you when it is needed. This is part of The Game of life which requires forgetting and letting go with good grace and a sense of non-importance of ones valuable Self. Do not fear to waste your time and energy, you will never run out of them and the "Crisis" in the World is only solved by those who follow the best instincts of their Spiritual Nature. As these work out all together, so each one of you finds yourself holding and demonstrating a bit of the necessary jig-saw puzzle of life coming into a new and better expression of itself, Myself-Ourself. Be with the big, fearless love which smiles on everything from its sense of Everlastingness and the Completeness that lies behind all Living Reality. For Reality is complete in one sense although it strives to play at Itself in another sense. Life Games are set up for playfulness and not because our being nature is frightened of losing anything. We think we can lose but we can't. There are safety nets around everything since all comes from perfect Love, Joy, Fun, Bliss, Wisdom and Humour! What you see as misery in the World is what you see in your child as it lives from crisis to crisis each hour of the day with each one being "the end of the world" in severity. Your world is like this child, it is the way young things grow...only the scale is different. They will both grow out of it. The Mormon Restoration, from 1830 onwards, can be seen as a move towards the state that Barfield terms Final Participation – which is one where Man carries-through self-consciousness into an understanding of spiritual progression towards divinity. Final Participation is, indeed, qualitatively the same state as full-divinity – which is why it is ‘final’ – because God is both agent (self-conscious) and also fully-participating in all of creation. It is the state in which there is no limit to knowledge, and all knowledge is potentially explicit. Mormonism – conceptualised in terms of its theology – can be seen as a very conscious process of spiritual progression; in which – layer-by-layer – cumulative prophetic and personal revelations will clarify and make explicit much that was previously an incomprehensible ‘mystery’ in Christianity. The first step came with the additional scriptures and revealed doctrines provided by Joseph Smith; but there was a built-in expectation that the process would continue with an unfolding of implications and more specific details. This has been concisely stated in the LDS church’s summaries of God’s Plan of Salvation (or of Happiness) – with (as examples) greater knowledge of the nature of God; the insight that men and women are metaphysically distinct, and existed as primordial ‘intelligences’ in pre-mortal life before becoming (literal) children of Heavenly Father and Mother; the description of pre-mortal, mortal incarnate, and post-mortal resurrected states – with spiritual progression towards divinity possible in all phases; the doctrine of celestial marriage and a permanent dyadic, creative and fertile relationship of a deified man and woman as necessary for ultimate divine status – and so on. Implicit in Joseph Smith’s revelations was a completely new metaphysics underpinning the theology – a pluralist, evolutionary, open-ended metaphysics – that has gradually become more evident (for those interested by it) with each generation. Why are we resurrected? Why are bodies better than being spirits? Although all Christians 'believe' (in some sense) that after death, at some point, Men are resurrected- this fact has not permeated very deeply into Christian reflection - because there is almost always an implicit assumption that it is better to be a spirit than to have a body. Yet, if that was so, why would the Creator our loving Father have resurrected us, when he could instead have had us reborn as immaterial spirits? Maybe many Christians would deny that that they have the built-in assumption spirit-good-body bad - but it is all over the place. Christ is seen as decending into incarnation in a human body, and many are amazed that a pure spirit would condescend to do this. Yet Christianity insists we will be resurrected into bodies - albeit perfected bodies that are immune to decay, destruction or death. But why? Why bother mucking-around 'confined' in bodies when we might we free-ranging spirits...? But there is not much indication of why this should be - why 'bodies are better' - whereas three thousand years or more of philosophical and religious history suggest that bodies are a limitation, not an advantage. Why, then, are bodies better - as it seems they must be? To answer this seems to require a sense of divine limitation which is anathema to most Christians - even though the Bible is full of it... full, that is, of an apparently accepted implicit assumption that God can only achieve certain purposes by certain linear and sequential actions - that God is limited in how he can achieve things, and that God achieving things requires time as well as the consent of Men. Well, it looks-as-if God cannot achieve the highest level of divinity, even for Jesus Christ, without incarnation and death followed by resurrection; because, of course, Jesus was resurrected - and that was how he attained his perfection. My conclusion is that - even despite all their disadvantages which we know so well - bodies are better than spirits; when 'better' is understood as developmentally or evolutionarily more-advanced. Why? I think the reason is related to agency; that an incarnate has greater agency than a spirit - that somehow the diffuse and unlocalised nature of a spirit means that a spiritual being cannot fully discriminate between self and not-self - and therefore there is a limitation and impairment of agency, or 'free will'. The essence of incarnation is the possibility of full agency - presumably that is what bodies ultimately are: methods or mechanisms by which minds are 'insulated' from other minds, and concentrated. I say possibility, not necessity - because agency may be feeble, is infrequent, may be displaced by external causes - including 'possession'. But without full agency, hence incarnation, the higher levels of divinity are unattainable. What Kind-of-Thing is the universal realm of truth? If we are to account for true knowledge, we cannot be reliant upon some multi-stage and approximate process like 'communication'. There must be direct access of our minds to truths; and this has usually been conceptualised as some single realm of universal truth, to which all people potentially have direct access - a realm that contains... well what, exactly? This is a kind of 'model' of reality - not reality itself - but assuming we do want a model, then there are two questions that spring to my mind. The first is to ask where is this realm; such that it is at the same time a single realm and yet every mind can have access to it? Various answers have been given - but of course, none of the answers maps-onto a materialist world picture of modernity. For example, the universal realm is inside everybody, yet each inside is the same place. This (or something similar) was an answer found acceptable by many people for many centuries - or indeed millennia - but is now supposedly incoherent. Yet its 'incoherence' is merely a matter of working from abitrary and materialist metaphysical assumptions. The second question is relatively neglected - which is what kind of ultimate truths are in the universal realm? Typically, (e.g Plato at the beginning, or Rudolf Steiner and Own Barfield in recent years) the realm is conceptualised as a place of Ideas or Concepts - in other words, by such accounts, universal truth is Abstract. But this won't do for me; because my understanding is that the universal truth of God's creation is Love - and love is not abstract but Love is the cohesion of reality. Love is therefore not an emotion, nor is it a physical 'force' - love is the ultimate cohesion between the beings of creation (and creation consists of beings, and their products). So ultimate reality is God and God's children (Men, and the various levels and types of angels and other beings - animal, vegetable and mineral as we modern people usually term them) and the Love between them - these beings 'cohere' by love; and love is between living, conscious beings. So; if we want to be philosophers or scientists, and to know more specifically about creation - our ultimate answer will be in terms of Love - and we can only get access to this knowledge by ourselves being a part of this vast and intricate, family-like network of Love. But what about evil? Well, evil rejects Love and can never truly know - because for evil all knowledge is ultimately a personal delusion. Evil has rejected God's creation and the network of relationships - the Pride of evil is to rely upon its own, specific, cut-off understanding and motivations. Furthermore, evil is un-understandable - since it is outside the realm of truth , reality, knowledge - evil is sealed-off in its own world. We know what evil is not - but can never know what it is - because there is no truth in evil... what this means is that truth is a universal, evil is not universal. Therefore, we should never 'believe' evil for the simple reason that evil cannot know; and the assertions of evil are merely delusional manipulations. That is, the devil is a liar, and father of lies, and so are all who have set themselves up as the ultimate source of 'reality'. So... my notion of the universal realm - or, at least the one I strive to live-by - should ultimately be one of loving human relationships. These might be approximated by 'concepts', 'ideas', 'facts'... but such abstractions are not the bottom line reality. Creation is Not held-together by concepts or any other abstractions - creation is held-together and structured by divine Love between living conscious beings. The lack of success among those who have explained the necessity for a transformation in consciousness has been near total - a few individuals have done it, to a significant extent - but nobody has been able to pass on the secret, nor train others. Why? What is blocking it? I think the answer is - no single thing, but many things; such that when we overcome one block, then there is another right behind it. As children, we are participants in the world around us - but as we grow we are socialised into alienation. This works by means of inculcating a materialist/ positivist/ scientist metaphysical system through-which we perceive the world; a set of basic assumptions which impose and ensure alienation. When we are children we see the world whole - we understand it as-a-whole, and feel at home in it - but we understand very little specifically. But the divisions by which we experience the world are unreal and dead - they are, essentially, false because arbitrary divisions - not organic, not endorsed by our deepest intuitions - they change and transform and they contradict each other. The world thus broken-up can never be reanimated, and can never be reassembled - we are given the world in dead dots, and the dots cannot be connected - and even if we did (somehow) connect the dots, they would still be dead dots. So - if we want to participate in the world again - we must go back to the drawing board; must reject virtually all of our specific knowledge about the world divided into bits and pieces - and re-build our specific understanding in a fashion which acknowledges the world as alive conscious and endorsed by our deepest intuitions. This is a huge task, and the the short to medium term there is an enormous loss of 'materialist' understanding - an understanding that is unreal, unsatisfactory, deathly... but of pragmatic value in keeping things going. This is a big ask - it is necessary but it will utterly change our lives. That is why there has been so little progress. We are locked-into a false, dead materialistic understanding that alienates us - but to cure the problem requires radical surgery... to cut-out modernity... and the prospect has, so far, been just too intimidating. So we prefer not to think about it - and live lives of distraction and intoxication, and existential solitude. It is always about surveillance. Bottom-line. Self-damnation (rejection of salvation) all-but guaranteed. And so far as I can see - the mass public are all-for the program; mad keen, clamouring to get it faster (anything to distract and amuse us while we wait for death-and-supposed-extinction, is welcomed with open arms and joyous smiles) - so I suppose it will happen. And perfectly rational - given the mainstream belief that there is no God, no real-Reality, no life beyond death; that Life is meaningless and purposeless, most of the world is dead and everything but (some) humans is unconscious; and truth, beauty and morality are just stuff we make-up... Well, with such a basic perspective - then anyone who offers a state of more-or-less-pleasant permanent mental distraction is naturally to be welcomed with open arms etc. How important is music in a human life? Alienation is the modern curse - even if you are among the tiny minority of serious Christians; this applies to you. (Except for a few brief flashes - if we are lucky); Everything in life is unreal, detached - nothing is, but is only 'about' - we cannot get to grips with our personal situations, because they are remote from us - on the other side of a chasm of imperfect 'communication'. Religion - as it is here and now, is a necessary step in the right direction - but it is not enough: it does not suffice. Have you noticed how shallow everything modern is - the people, and the institutions? Everything except nature and the finest art and literature and (if we are lucky ... the occasional religious experience) but even then only in flashes. A life that is dead - perhaps pleasurable - but dead, meaningless and with no sense of lived-purpose, and dis-engaged, lacking in 'participation' except when we aren't thinking (in dreams, altered states of consciousness, intoxicated...). This is an urgent matter - and non-negotiable: we must get to work and push for something better, something adequate. And must means must - because if we don't solve this one, then - really - what is the point of modern life? On a spiritual level it is a machine for damnation, a locked-in-state of alienation and unreality and deadness. That is of no use to us, no use to God; and if nothing better can be developed then He might as well wind it all up and start again - after all, what is the point of having souls born into such an environment that the best that can be expected is that a few people will manage to resist to the extent that they do not actively-will their own damnation? Really, in an ultimate sense what is the point of that kind of world - of this kind of world? The world is meant to be a place of spiritual growth, not a state of siege with survival until death the only victory. So the task is before us - and perhaps only a handful of individual people and no human societies have ever yet achieved it - the task of living life engaged, participating. and fully conscious of ourselves and our situation. The task is a new and higher kind of human consciousness - that is what we must achieve; that is what the great 'Romantics' from Blake, Coleridge, Wordsworth, Goethe, Steiner, Owen Barfield, William Arkle, Colin Wilson and a few others have been telling us and trying to do for the past two centuries and more. They did their best, they made many suggestions, they qualitatively improved our understanding; but when it comes to achievement... we are no further forward, indeed (since the accelerating totalitarian micromanagement of human thought via saturation with the media and bureaucracy) we are further back than ever before in the history of the world. How? I don't know - but we simply must do it. It should be our number one priority now, today, this very hour, starting immediately. How should we make big life decisions? - Given that the usual two methods - logic or gut-feelings - are each inadequate, yet they cannot be combined. The logical method is most commonly represented - at the extreme it involves something akin to stating a proposed course of action then making a list of pros and cons - and subtracting the disadvantages fro the advantages to see whether the outcome is net positive or negative. The inadequacy of this is apparent from considering how it might be employed to decide whether or not to marry someone. Yet gut-feelings, in many ways the opposite of logic - and regarded as tending to compensate for the inadequacies of logic - are also inadequate. Their main inadequacy is that they are unstable - they vary from day to day, often from hour to hour - also, they are easily manipulated. And furthermore, gut-feelings tend to favour short-termist and selfish courses of action. Christians also have recourse to asking for divine revelation - and when this is clear and forthcoming it should be decisive. Yet it seems likely that there are many problems in life which we are meant (and I mean divinely meant - as part of the destiny of our particular lives) to struggle-with and work-out for ourselves. In such instances - for our own good - there will be no divine guidance forthcoming; and we will - for our own ultimate benefit - be thrown-back onto our own resources. My sense of it is that we need to sort-out several aspects of a situation, before we can make good decisions. In the first place we need to have an understanding that there is indeed such a things as a right decision to make - and that this rightness is defined in terms of spiritual aspects. For instance; the right decision is not defined as the one that leads to optimal health or happiness, comfort or convenience, in the short term - but the one which is most likely to help in achievement of our eternal spiritual destiny (or necessary personal development); and this is difficult for us to evaluate given our limited and distorted perspective. This implies that we need the right motivation - or at least to aspire to the right motivation - if we are to make the right decision. Having established this framework there are two main things to get right: The first is that it needs to be our true self which makes the decision; the second is that in asking for a decision, the true self must think in a way that is active - being both purposive and intuitive. It must first be our true self that is doing the deciding - because only the true self is free, autonomous, an agent. Most people, most of the time, are working from false selves - habitual personalities that 'automatically' process information and make decisions on the basis of socialisation or training; and by being trammelled with external constraints, and learned or spontaneous compulsions. Modern false selves are mostly materialistic - thereby ignoring or denying most of our experiences and thoughts - things known by instinct, inspiration, imagination, intuition etc. The non-materialistic 'subjective' modern selves tend to be distortions - sometimes inversions - of instincts; which we have been corrupted and propagandised into - or are the consequences of the artificiality of life. So we need to do the two things of thinking actively, consciously and universally (in a way which includes all aspects - not just the material) - and this thinking must be done freely by the true self (and not automatically by false selves). Since not very many people can - at present - do this combination - then difficult, strategic life decisions will usually tend to be made badly. This analysis suggests that learning how to think properly is - or ought to be - a major priority for modern people. Yet, of course, real thinking is not just a means to an end - but an end in itself; and if we treat real thinking as merely a means to an end, then we will not be able to find the motivations needed to develop it. We need to recognise, we need to be convinced that - real thinking of the kind I describe above is something we ought to be doing for the highest, deepest, most necessary of reasons; that it is, in a phase, divinely-destined. This is why I feel strongly that real thinking - conscious, universal and purposive thinking by the true self - should be a major priority here and now, and for (almost) everybody. Fear is a sin, and indeed one of the very worst of sins - a sin that is capable of singlehandedly wrecking the whole of a human life. I don't mean fear as an emotion - that is just a matter of an evolutionary adaptation to threats... I mean existential fear: that is, fear as a mind-set, fear as a basic stance towards life. For Christians, to live in a mind-set of fear is to deny the basics - to deny that God the creator is our loving Father. Fear is, indeed, a variant of despair - which is the assumption that God has placed us in a hope-less situation - which would mean that God did not love us or was not the creator of this world. Christians have often - and still do - deliberately create fear - and I mean existential fear, the worst kind, the worst kind of sin - as a way of supposedly enforcing faith. This is crazy if it is sincere... certainly it is wicked and counter-productive. When this happens, something has gone terribly wrong - sin has overcome the Christian message, the Gospel has been perverted. Life, by this account, ought to be a continual submission, a continual propitiation, a continual attempt not to offend the tyrannical and jealous and vengeful forces that are assumed to control things... If we do NOT fear then we will be crushed, to teach us not to presume, teach us not be pride-full... The idea arises that continual and expected and mandatory fear is the core way of avoiding pride. Fear becomes a duty. The fear-full are prone to inculcate this same existential dread in others - perhaps on the excuse that people need to be afraid or else they will not avoid sin... But this is an appalling thing to do to others - fear can rapidly and permanently get out of control, grow like a cancer in a person or a community - and kill it. Eternally kill it. Systematically to inculcate existential fear is a double sin - because, unlike personal sins, it is deliberate and avoidable - and this requires repentance even more than fear in oneself. If we do fear then it must be repented; and I mean must - not because we will be punished by God if we don't repent our fear, but that by fearing we have already rejected God implicitly... we have already rejected the God of love and rejected our relationship with him... We have specifically rejected the fact that he is our loving Father and we are instead insisting that God is a tyrant who requires that we live in continual and systematic terror. So fear is a sin, and a terrible sin which can destroy everything: it must be repented. We need to want to be free of fear, we need to aspire to a sublime confidence about life: that is what God wants from us. Fake theories are much worse than fake facts because people make sense of facts using theories. But modern mainstream theories - whether in science, law, medicine, religion, politics or the mass media - do not deserve the name of theories - they are so small, so specific... let's call them micro-models. Micro-models are the sound-bites of theory which we get everywhere. Each serves mere to fake-explain some tiny sliver of facts - and there is no possibility, no attempt, and no requirement that these micro-models should add-up to anything more. In fact, if you even try to add them up - or to point out that they cannot be added up - you will be ignored, mocked or attacked (according to the perceived importance). Micro-models replace understanding - their special quality is that they do not allow understanding. They operate everywhere - they are the norm not the exception. And - with the best will in the world (which is, anyway, lacking) micro-models cannot be added-up to anything bigger, cannot be made sense of... they are dots which cannot ever under any circumstances be joined to make something greater. Micro-models are, indeed, perfect mechanisms for demonic activity: a fake understanding of fake problems which makes no sense and cannot lead to either understanding of life or purpose in life: in sum - the perfect mechanism for inducing helpless despair in all matters across the whole population! Moral: Metaphysics - the examination of our fundamental assumptions regarding the basic nature of reality, and the creation of theories of the utmost generality - is the single most neglected yet urgent subject of our era. There is in Man an inclination to know the Divine. The second inclination in him - that is, in the Man of this era - is to know the Christ. The third inclination in Man is to know what is usually called the Spirit, or also the Holy Ghost. 1. Where a Man denies the Father God - denies a Divine Principle in the world as such - there is an actual physical defect, a physical sickness, a physical flaw in the body. To be an atheist means to the spiritual scientist to be sick in some respect... an actual sickness in a man who denies what he should be able to feel, through his actual bodily constitution. If he denies that which gives him a healthy bodily feeling, namely that the world is pervaded by Divinity, then he is a sick man, sick in body. 2. There are also many who deny the Christ. The denial of the Christ as is denial of something that is essentially a matter of destiny and concerns man's soul-life. To deny God is a sickness; to deny the Christ is a calamity. 3. To deny the Spirit, the Holy Ghost, signifies dullness, obtuseness, of a man's own spirit. So - atheism denotes an actual pathological defect. Failure to find in life that link with the world which enables us to recognise the Christ, is a calamity for the soul. To be unable to find the Spirit in one's own inmost being denotes obtuseness, a kind of spiritual mental deficiency, though in a subtle and unacknowledged form. What is real, true or fantasy? It was just over 5 years ago on this blog that Michael A Woodley and I published the discovery of a rapid and severe slowing of simple reaction times over the past century-plus; and the interpretation that this implied an equally precipitous decline in general intelligence ('g') which has been missed by IQ testing. On Michael's side, it led to a series of papers (one of which I co-authored) which - using multiple methods and measurements - are overall consistent with the proposed decline; and can be taken as confirmation of the thesis of that original blog post from Feb 28 2012. So, a lot has happened in half a decade - which is not a long time in science! The modern idea of modern philosophy assumes that epistemology is the most fundamental subject - questions about 'knowledge' such as how we know we know, or how we can be certain. But the first and most important philosophy is metaphysics - the study of the primary, basic nature of reality - which is also the study of the key assumptions we make about reality. Examples of what I mean abound from high status to lowbrow bar-room conversation, the usual modern philosophical discourse fails to notice that it is only playing with a set of assumptions that create the outcome - meanwhile the assumptions are unnoticed or denied. As when people assume a fundamental reality in which there is no order, consciousness or morality - and after vast arguments finally conclude that in reality there is not order, consciousness or morality... unaware that they themselves have assumed that which they believe they have 'proven'. Most modern people simply refuse to admit they have any primary assumptions about the nature of reality - and they assert that their basic beliefs are forced-upon them by experience, logic, 'science' or whatever. Philosophers generally get terribly unsure about the possibility of certain, reliable, communicable knowledge - without acknowledging that their metaphysical assumptions have already ruled-out anything of the kind. Most modern people have a metaphysics which assumes that reality has no meaning or purpose - but they do not even realise that this is what they are assuming - and may become miserable and despairing about their failure to find meaning and purpose in experience, logic or 'science'. The ridiculous tragedy of the situation is capped-off by the fact that those who call for metaphysics, who imagine that they are actually doing metaphysics; in practice themselves regard their assumptions as necessary and based on compelling evidence and logic (which would mean, if true, that they were not primary assumptions). It would be absurd and amusing if the situations wasn't so tragic and lethal. The modern world has - in effect - laboriously constructed a perfect random number generator and is minutely examining the output to discover patterns. In such a world of to ingrained, habitual and wilful self-blinding, to acknowledge the existence of our own metaphysical assumptions and those of others; to acknowledge that all knowledge must be based-upon metaphysics; to acknowledge that we cannot do epistemology without metaphysics - comes as a liberation: like waking from a nightmare delirium into the clear like of day. Totalitarianism aims to control thinking - by a system of maximum monitoring. George Orwell got us mixed-up about this; because of his emphasis on violent coercion and the assumption that it was the violence which was bad about totalitarianism - and the atheist assumption that the infliction of suffering by violence is the worst possible thing. The upshot is that when there is no violence - and especially when there is no violent infliction of suffering - modern people cannot perceive totalitarianism: they simply don't notice it, or even deny its presence. Phrases like 'soft' totalitarianism implicitly suggest that totalitarianism without violence is not really so bad - and nobody fought hard to defend against the triumph of 'soft' totalitarianism, because that didn't sound so bad. But the badness of totalitarianism is, of course, spiritual - not physical. Totalitarianism is evil because of its effect on our souls - not because of its effect on our bodies. Totalitarianism aims to control thinking by a system of maximum monitoring - to monitor the people down to a level of detail so fine that the only possible compliance is to think in the approved way. It is nothing necessarily to do with the infliction of suffering by violence - violence is just one possible means to an end. Modern Western society is objectively very highly totalitarian - especially in the workplace, compared with fifty years ago - because thought is very highly controlled. Absence, presence, threat of violence has nothing to do with the fact. But why is totalitarianism bad? - if it isn't violent? Why resist it? The only reason is if you believe that Life is about something more. The only reason to resist having one's mind controlled is if you believe that there is something very important to do with your mind. Modern people do not resist totalitarianism because they do not believe they have anything better to do with their lives than to think in the approved way. Modern people believe that Life is merely about the balance between pleasure and pain (maximising the first, minimising the second) - and altruism merely means wanting the same for other people. If totalitarian thought control can be imposed in a way that does not inflict suffering with violence - modern people are quite happy to accept, indeed embrace, totalitarianism. Only religious people who believe that Life is about something else than emotions, and something more than mortal existence, have any serious objections to their minds being comfortably colonised and directed by the linked bureaucracies of employers, the state and the mass media; and there are so few Western religious people; and they are so scattered and mutually mistrustful or hostile, that their resistance to totalitarianism has, so far, been apparently ineffectual. Why resist totalitarianism? If you have something better to do with your life; and therefore if you wish to avoid self-chosen damnation (which is, ultimately, the only kind of damnation). But if you deny any real, objective, vital purpose of your life, and if you deny the reality of damnation - then you will surely accept, embrace, joyously join-in with the work of totalitarianism. Of course, much, most and in some people all thinking is automatic; merely trained or habitual - or a product not of thinking but instead of some causal factor, whether internal or external. Free thinking is self-caused - and if your metaphysical understanding does not allow for self-causation, then you cannot be free (or, you cannot acknowledge and will deny your own freedom). Freedom is that thinking which comes from the true self - and the true self is able to be free because it is divine - at least partly. We are divine because we are children of God - and not fully divine because we are only very immature children of God. It follows that we are not always free - and some people are, apparently, not-at-all free - not least because they deny their freedom (as above). Self-acknowledged freedom is, therefore, pretty much restricted to Christians - and among Christians only to those who really believe that: 1. we are really Children of God; 2. with something of divinity in us (even in mortal earthly life); and 3. (sometimes, potentially) autonomous agents, capable of originating new, uncaused thoughts from an uncorrupted (albeit embryonic) true self. Note added in explanation: By 'restricted to Christians' I mean that Eastern philosophies tend to regard external reality and the self as illusions - as does scientism/ positivism/ materialism; and the pure monotheisms tend to regard the autonomous self as essentially operating in defiance of God - and indeed quite a few Christians have also seemed to adopt this assumption in practice, if not in theory. Only a (relatively) few Christians seem to give free will/ agency/ the autonomous and primarily creative self the full value (both in theory and in practice) which is in line with the fundamental requirements of Gospel teaching. The modern workplace is objectively totalitarian - what are you doing about it? Monitoring is extended down to a timescale of minutes; and everyone is enlisted to provide evidence against themselves and each other by the totalitarian systems of 'quality assurance' management. This is not just or primarily a system of physical control - but a strategic system of thought control; designed to entrap people, to enmesh them in lies and compromises from which they see no escape but to beg and crave the indulgence of their superiors. In the modern workplace; you are in breach of regulations at every moment - the evidence for which is supplied by yourself and your colleagues. It is literally impossible to do your job and comply with the demands for monitoring, and to comply with the overlapping and conflicting requirements for ideology. The modern worker, 'works' hard, is very 'busy' - but does nothing functional; indeed, the harder he works, the more work he inflicts on himself and his colleagues. The finer the mesh of the steel web of bureacracy he weaves around himself and his colleagues. Indeed this just IS modern work - a system of creating work and adding more and ever-more systems of monitoring, audit and control. A waste of time? Yes of course. But that is not the main problem - this is not just a 'waste of time'. Totalitarian systems are not merely futile - they are actively evil. Totalitarianism is control with a purpose - and that purpose is the destruction of Good, the denial of God - the inversion of Good, the damnation of souls. People used to know this naturally without needing it pointed out - people used to feel when they were being corrupted. But now? They feel a hopeless misery, yes - but they are already so corrupted that they have lost the ability to perceive further corruption. We are all of us - in the workplace - concentration camp guards and bureaucrats - that is, when we are not the prisoners being made to extend and reinforce our gaols. People do not believe in the instant and infinite power of repentance - so they see no way-out from the state of enmeshed collaboration and their suffocating history of being complicit in tyranny. But repentance is the answer - and only Christ offers repentance. First repentance to escape the fine steel mesh that traps us - and then? Steps to freedom. Should it be women who lead spiritual revival? Why should victims of Political Correctness "never resign, never apologise"? The advice never to resign, never to apologise is good advice - but the reason for it is misunderstood. The reason is not because then things will work-out better - that is not knowable, outcomes are not controllable. Part of the reason is that resigning and apologising is exactly what 'they' want you to do - and that fact, in and of itself, ought to be sufficient evidence that resigning and apologising are a bad idea. However that resignation and apology are what is wanted leads onto the question of exactly 'why' the secular Leftists - i.e. the mainstream socio-political Establishment of all 'parties' - so much want their victims to resign and apologise? The answer is related to the underlying objective of the Establishment - which is to lead the world (first The West, then everybody else) into self-loathing, despair, implicit suicide, and ultimately chosen damnation. Given that PC witch-hunts are primarily directed against those who tell the truth - resignation and apology means that the victim publicly repents his Good action. To do something Good, and then to repent it - is actually worse than doing nothing; because it teaches (with the explicit endorsement of the victim) the public lesson that Good is actually evil. Un-repented evil is, of course, the main weapon of the secular Left (by moral inversion they re-label evil as good, ugliness as beauty, and lies as truth) - but repented-Good is even more powerful a weapon of corruption than un-repented-evil. This is also why most PC witch-hunts are directed against those of 'liberal' views, especially those who broadly favour the sexual revolution - rather than against those who have strong and primary religious convictions. The witch-hunting Leftists know that other Leftists can be relied-upon swiftly to cave and capitulate. This is because secular Leftist/ sexual revolutionaries/ 'liberals' (whether or not they term themselves socialist, democrat, conservative, republican, libertarian or alt-right) are all very weakly motivated when it comes to moral principles. Secular principles are essentially expedient, this-worldly, and orientated towards hedonic goals: the enhancement of pleasure and minimisation of suffering in life. Such people can easily and quickly be pressurised into 'selling-out' - by simply piling-up the threat of disincentives. So - when the chips are down (as opposed to their theoretical boasts or even sincere intentions) the secular/ liberal/ leftist/ sexual revolutionaries among victims of PC witch-hunts have almost all, and rapidly, capitulated - and done exactly what was wanted of them: resigned and apologised. They may talk tough before the fact, they may say they won't capitulate - but, in fact, they do. It is pretty much only those of strong religious faith who ever stand firm and refuse to apologise or resign; and this is simply because real religious motivations are much, much more powerful than secular motivations. This is just a fact of human nature - known for centuries (or millennia). And this is why a secular backlash against secular Leftism will not be effective. Any potential leaders will be picked-off sequentially, as and when they threaten to challenge the core agenda. When things get tough - people who have rejected the divine will not hold the line, and they will capitulate. Which is why there must be a spiritual awakening, a religious revival: nothing else can work. Of course, real religious faith cannot be had merely because it gives strength of motivation - rather, strength of motivation is - or can be - a consequence of real religious faith. Strong faith is based upon knowledge of truth; and not on any kind of expediency or hoped-for this-world consequence.